Happy Craftersday, everyone! 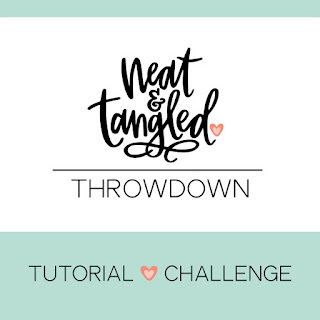 I have a second entry to the Neat and Tangled Throwdown. I’m still working with the Kitty’s Favorite Things set but I have a different vision this time. Click the Neat & Tangled button to see how you can enter the contest and to see the other entries. This post contains affiliate links. Please see disclosure for more details. In the video I used the Fineline Resist Pen, a masking fluid, to mask my kitty so I could ink blend over him. From my experience, Fineline leaks like a sieve. I haven’t done any extensive testing but I’m very sure the leaking is due to the internal threading of the bottle cap (part “C”) to the bottle. The threads don’t fit up to the bottle in the right way to prevent the liquid from seeping out. Fineline could fix this by either using metal threads or by having a different closure method all together but I don’t work for Fineline and I don’t know the cost analysis or business decisions that went it to this product. All I can tell you is the solution: Tape. In the video I used masking tape but any tape will work, as long as you put enough on it to cover the leaks. When the bottle is empty, just remove the tape and refill it. If there is any masking fluid on the threads it won’t dry to the point of permanently fixing the bottle and making it so that you can’t uncap it. And if Fineline masking fluid is too much hassle, rubber cement does the same thing. It just takes a little bit more finessing to get the same results. Thanks for watching! I have a list of the products used at the bottom of this post. Make sure to share this post on social media or Pin it using the tile below. Have a great day!